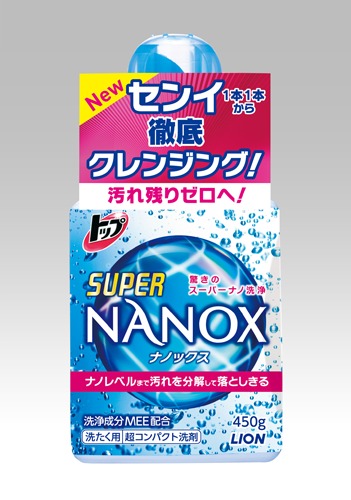 Lion Corporation (President: Itsuo Hama) announces the nationwide release of new TOP SUPER NANOX on February 17, 2016. This super-concentrated liquid laundry detergent features excellent detergency to help clean grime off each and every fiber. According to a 2015 Lion survey, what 81% of consumers most desire in a laundry detergent is efficacy in removing grime from clothing. Many consumers, however, are not satisfied with the cleaning performance of their current laundry detergent, complaining that clothing yellows or dulls over time or that, despite diligent daily washing, clothes never seem to get really clean. At the same time, changes in how laundry is done are ongoing. For example, the desire to save water, an increase in average washing machine size, and the growing prevalence of single-person and dual-income households are all contributing to a rise in consumers who do laundry in larger, less frequent loads. These factors have, in turn, mean that laundry is increasingly done in large volumes using smaller quantities of water. As a result, many consumers are finding that grime does not come off as well and that clothing tends to yellow and dull. Against this backdrop, Lion has developed new super nano-washing technology, achieving significantly improved detergency against sebum. 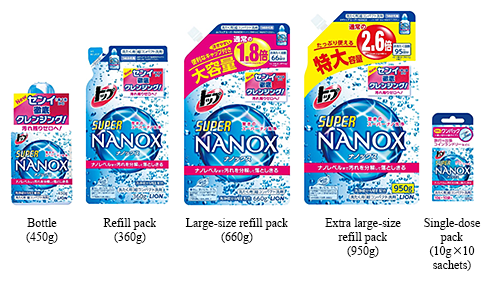 Using this technology, Lion has dramatically enhanced its TOP NANOX super-concentrated liquid laundry detergent, released in 2010, which offered nano-washing technology using the proprietary high-detergency ingredient MEE. * Now, Lion is announcing the launch of this new, enhanced super-concentrated liquid laundry detergent, TOP SUPER NANOX. (1) Newly developed super nano-washing thoroughly cleans grime from every fiber! The detergent’s new formula combines Lion’s proprietary high-detergency ingredient MEE with an LO (“lift out”) ingredient. The LO ingredient penetrates fibers, helping to lift out embedded contaminants. Once lifted out, the grime is quickly broken down to the nano level by high-detergency ingredient MEE to be washed away. Yellowing and dullness is caused by the buildup of the grime that is left behind after each wash.
TOP SUPER NANOX thoroughly cleans grime from every fiber each time laundry is done, reducing yellowing and dullness, so clothes come out bright and beautiful. Efforts to conserve water and doing laundry in larger, less frequent loads mean that less water is used per piece of laundry. To address this shift, TOP SUPER NANOX helps prevent grime that has been removed from reattaching to clothing. This property is especially helpful in preventing dullness in items where it is particularly noticeable, such as white undergarments, business shirts and towels. TOP SUPER NANOX achieves high detergency even in washing conditions that limit the effectiveness of the mechanical force of washing machines. 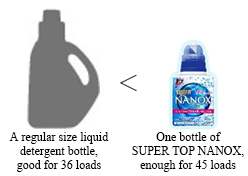 Even when clothes are packed into a washing machine or a mesh washing bag, making it harder to remove contaminants, TOP SUPER NANOX acheives significantly improved detergency against sebum compared with previous liquid laundry detergents used in the same washing conditions. Generally, the removal of contaminants becomes more difficult when clothing is packed into a mesh washing bag. The detergent is formulated with a highly concentrated optimal balance of four surfactants, most significantly Lion’s proprietary high-detergency ingredient MEE. In addition to ordinary washing use, TOP SUPER NANOX is effective at removing stubborn grime when applied directly as a pre-treatment for particularly soiled areas, such as shirt collars or cuffs. Good for 1.3 times for more laundry than a regular-size bottle of liquid laundry detergent2 (compared with another Lion product).